here are a lot of remedies out there for people who suffer from period pain. Some people swear by drinking tea. Others cuddle up with a heating pad or hot water bottle. There's also a host of medications out there to provide some relief. None of these remedies include marijuana, but that may be about to change. Look, periods are basically the worst thing ever. They’re inconvenient, they’re messy, they can make you grouchy and seem to strike at the worst times ever. But periods hit some people harder than others. The pain people feel during menstruation is called dysmenorrhea. Most people with periods deal with primary dysmenorrhea, which is painful but normal. However, some period sufferers deal with something called secondary dysmenorrhea. That’s when the pain is actually the result of a disorder within the reproductive organs themselves, such as endometriosis, adenomyosis, uterine fibroids, or infection. For people suffering from secondary dysmenorrhea, the typical cramp remedies just aren’t going to cut it. Not even all the heating pads and chocolate bars in the world make a difference. Luckily for people suffering from particularly intense period pain, there's a new product on the market. And it involves marijuana. 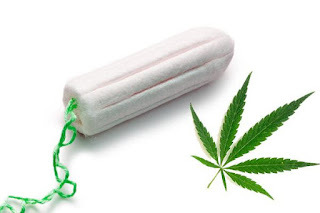 Last May, the state of New York added period pain to the list of conditions which allow people to obtain prescriptions for medical marijuana. The company, which also makes something called a “sensual enhancement oil” has developed a product aptly named “Relief” that contains a specially formulated blend of THC and CBD — chemicals that are known to relax muscles and release tension and cramping. Foria’s Relief is actually a suppository, meaning that it’s inserted into the body rather than being swallowed like traditional pain medication. That way, Foria claims, the pain-relieving chemicals are applied directly to the area that most needs relief. Doesn't sound all that bad, does it? It might be a touch untraditional, but it’s certainly not the worst idea I’ve ever heard of for finding relief. Plus, using Foria’s product is certainly more discreet than smoking a joint, right? Plus, if it helps the people who need it, it sounds like a solution that anyone should be able to get behind. What do you think? Would you try a marijuana-infused suppository?